Bike MS: City to Shore Ride – wife. mother. awesome girl. Friends, if you are ever in the Philadelphia area the second weekend in September, I highly encourage you to sign up for Philly Bike Club’s Scenic Schuylkill Century. This year was my second year riding and I hope to keep going as long as I have friends to help the miles pass. 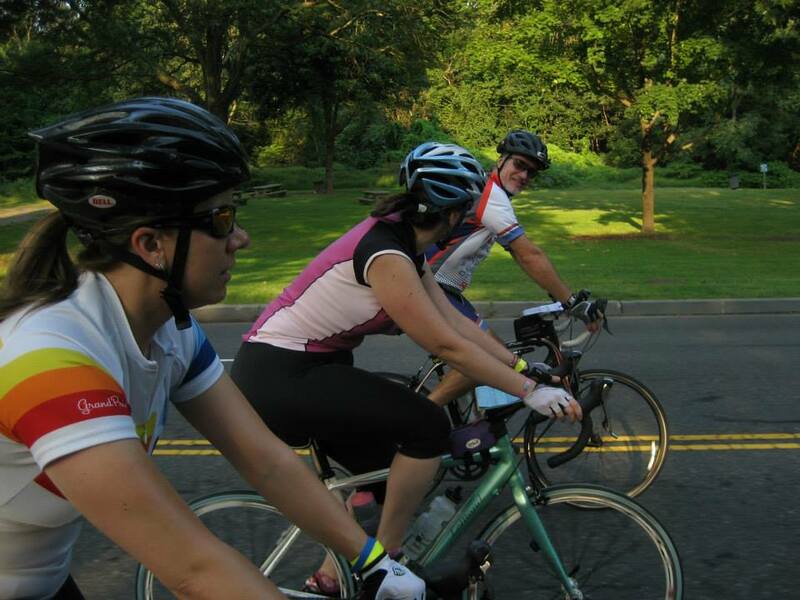 The Scenic Schuylkill is an incredibly well-supported ride that showcases the beauty of the area just outside Philly. Starting at the iconic Boathouse Row and winding north into the hills of Manayunk to Cedar Grove then on to Evansburg State Park. The view of Philly from Potshop Rd is unmatched – the city so far away it’s ethereal. From Evansburg you can choose to head back to the city (and complete a metric) or head northwest to Schwenksville. Do not be discouraged by the 6,000+ feet of elevation gain – there are very few monster hills. The hills are really after the second rest stop in Evansburg State Park and are more rolling-hills than Super-Steep-Why-Am-I-Doing-This. Another rest stop at Camp Hope then more climbing before you see more downhills than uphills. Do not be fooled though – there are still some hills on the way back into the city. But nothing compares to bombing down Main Street in Manayunk on the way back to pizza and liquid refreshment. Improved my time this year as well – 102 miles in 7:40 last year; 103 miles in 7:20 this year. And yes, I made it back to the start in time to get a few plain slices and two full-sugar sodas. No, I didn’t feel bad about that. Three weeks and not enough riding later, I set off on another century, the annual Bike MS: City to Shore ride from Cherry Hill, NJ to Ocean City, NJ. This is most people’s Big Ride of the year and they train all summer for it. As a year-round cyclist who tries to keep her base miles around 50, this is probably the easiest century in the area. It’s mostly flat – only about 1900′ of elevation gain and probably only because of the two bridges at the end of the ride to get over the harbour to the Shore. It is incredibly well-supported – the century alone has about seven opportunities to take a break. My neighbor and bike commuting friend and I carpooled to the start again. This time instead of sitting in off-ramp traffic, we opted to go one more exit further and parked within minutes. Unfortunately this also meant not getting to the festivities at the main start but we were only a quarter of a mile up the (not very well maintained) road. We hit the road around 6:15am – before the sun came up. Totally didn’t think it though so I borrowed my friend’s long-sleeve lightweight shirt to stay warm until we got past the first rest stop. I also opted for my new lightweight thermal three-quarter tights from Twin Six. Picked them up at an incredible deal during a sale and they are supremely comfortable. Perfect for the chilly autumnal mornings when you need a little more now that won’t overheat you later. We ended up skipping the second rest stop option (“Lunch Stop Ahead!” “wait – it’s only 8:30am … too early!”) and also the century loop rest stop, averaging about 25 miles between rest stops. We took only 15 minutes at each stop – enough time to use the port-o-let, refill water, shove some food in our faces and hit the road again. 1. I was having stomach issues again leading up to this ride and sure enough there was about a 25-30 mile portion in the middle of the day where I struggled to keep it together. I felt really bad for my friend because I had to dial down my speed a bit because I was hardly eating and didn’t want to bonk from over-exertion/under-nutrition. And I wasn’t talking at all because I felt incredibly nauseous. I eventually got back on the level, picked up the speed, and finished strong. 2. I have decided to improve my spinning and stayed in the little ring all day. Averaging 17+ mph on significantly more miles than not was incredibly gratifying and my legs still felt relatively fresh at the end of the ride. I’m hoping this winter will continue to be fairly mild (let’s be honest, I miss big snows) so I can continue to work on increasing my cadence enough to switch to the big ring and spin the hell out of a bigger gear. The weather was perfect for the ride. My favorite moment was between the two bridges when you are on a little two-lane road right up against the beach, the ocean waves crashing and rolling up the sand. SO PERFECT. I was so sad that I wasn’t going to be spending one last weekend Down The Shore. But the reason I wasn’t staying down the Shore was because I had an appointment to get some new ink. I was supposed to get it last year but it didn’t work out. This year I made it happen. My tattoo artist is the best in the biz and she was guest spotting at a shop on Long Island, a few hours from Philly. 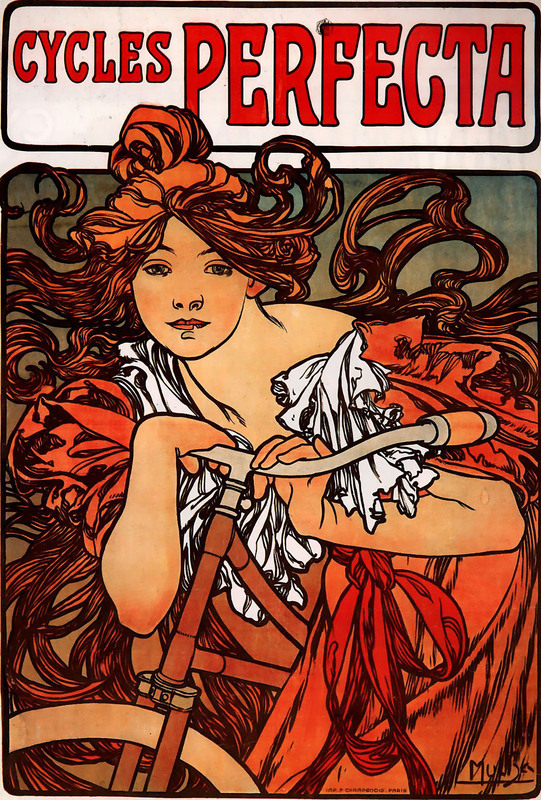 The piece is Cycles Perfecta by Alphonse Mucha (1902 bicycle company advertisement) that perfectly captures the essence of a girl and her bicycle. Four hours of line work with minimal breaks (like 10 min each hour). 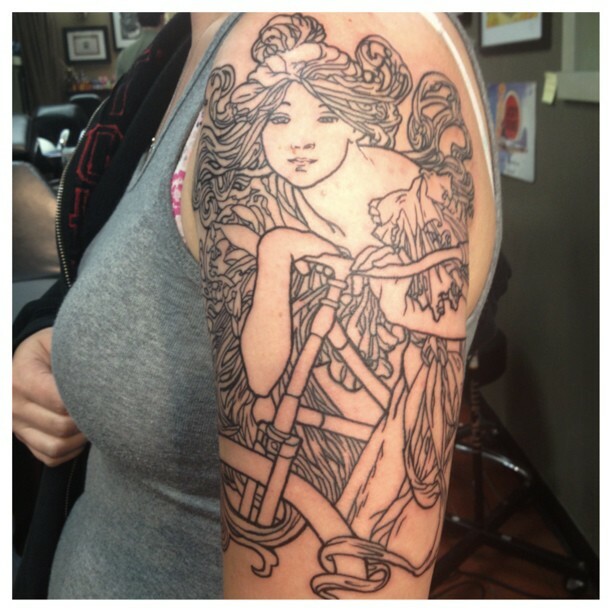 Next time I see her it will be to get this colored in. In health news, I had an endoscopy this past week and they biopsied some tissue for testing. Hoping to know more next week – praying for a relatively easy fix. I’m tired of feeling terrible all the time. My diet is severely limited some days. I lost five pounds in a few weeks due to dwindling appetite. Funny how fasting the day of the procedure was NBD because not eating keeps me feeling relatively normal. Totally unsustainable, I know. That’s why I’m getting help. This weekend is expected to be gorgeous but I’m going to take a quick break from my bike. Even though I really want to go mountain biking. 1. Tattoo needs to stay out of the sun. It’s going to be too warm for long-sleeves and it’s not ready to put sun sleeves on (elastic at the top). 2. Health. I need to take care of myself until I hear back from my GI doc. I can tell you 100% I did not eat enough on my City to Shore century – less than I did for the Scenic Schuylkill (and that wasn’t much). And I still need to get back into running – my 5k is in about a month. And it’s been that long since my last attempt at running. So maybe not this weekend, but I’ll see you on the road or the trail soon.